Teams are now halfway through the ACC baseball season, and it’s important for Virginia Tech to improve over the second half if it wants to avoid missing the ACC Conference Tournament for the fourth consecutive year. As the ACC Conference Tournament is currently constructed, the top teams from the Atlantic and Coastal divisions, along with the next ten best teams based upon conference winning percentage regardless of division, are entered into the field. That leaves the bottom two teams in the conference missing from the tournament. 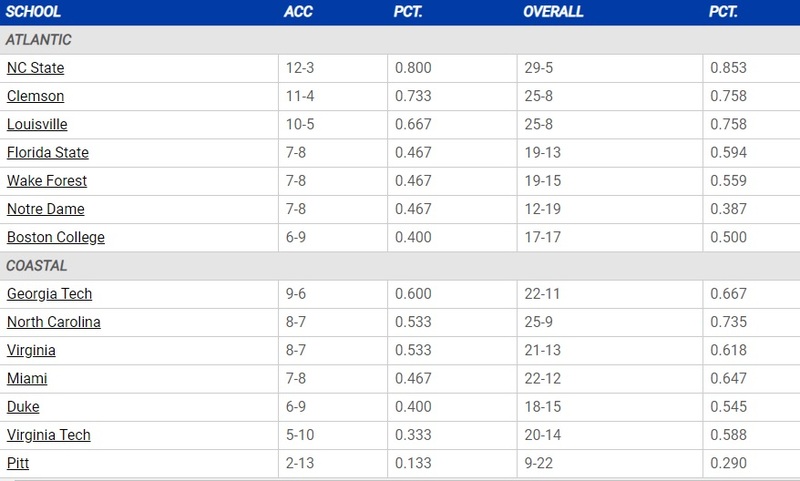 As it currently stands, the Hokies (20-14, 5-10 ACC) would miss the field, but there’s plenty of time to right the ship, beginning this weekend when Virginia Tech travels to Duke (18-15, 6-9 ACC), trailing them by just one game in conference. Last weekend, the Hokies had one of those difficult road series against Wake Forest inside the hitter-friendly confines of David F. Couch Ballpark. The Demon Deacons took two of three from Tech. In Game 1, Virginia Tech jumped out to a 2-0 lead after the first inning, but Wake Forest’s bats put up 12 hits, including three home runs, to win 8-3. On Saturday, the Hokies held a 6-4 heading into the seventh, but Bobby Seymour’s three-run shot put the Demon Deacons ahead, and they held on to win 8-7. In the series finale, Tech struck early and led 8-0 after four innings. Wake Forest eventually mounted a massive comeback, but Jaison Heard limited the damage late to pick up his first save with the Hokies, winning 10-9. Still, being able to bounce back on Sunday for an all-important ACC win was integral for this ballclub moving forward. In Sunday’s win, Kerry Carpenter, Nick Biddison, and Dalton Harum all hit moonshots to catapult the offensive fireworks. Horanski also tallied three hits and three RBIs to finish 6-for-11 with a home run and five RBIs over the weekend. It was a load lifted off the catcher’s shoulder after going hitless versus Clemson in the previous series. Following the trip to Winston-Salem, Virginia Tech returned home for two mid-week tilts. 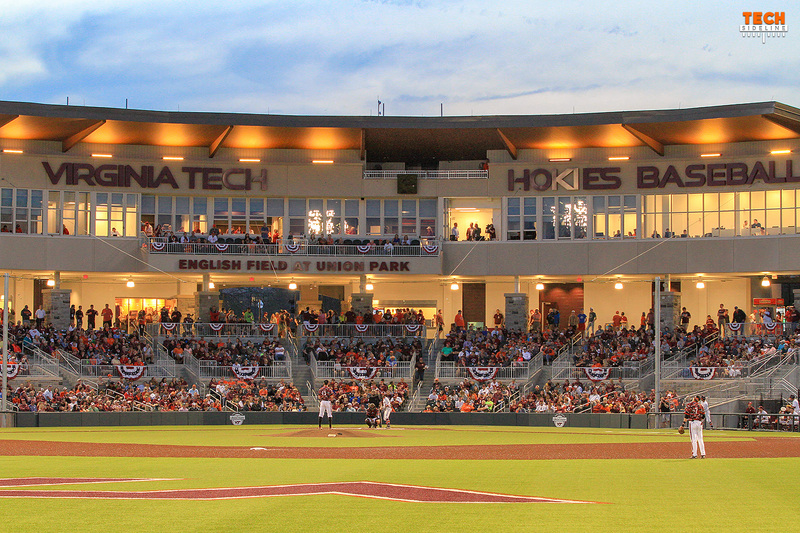 On Tuesday night, the Hokies defeated Marshall 7-0, and the shutout was the 500th win at English Field at Union Park. Freshman Nick Biddison ignited the charge for Tech when his grand slam (the second of his young career) put the Hokies up 5-0 after the second inning. In his first season, Biddison is hitting .279 with five home runs and 24 RBIs, good for third on the team. He credits his progression this year to hitting coach Kurt Elbin. Szefc pointed to two guys in particular who were critical in maintaining the shutout for Virginia Tech. Ryan Okuda pitched three innings, allowing just two hits and striking out three batters in middle relief. Connor Yoder then entered the game in the eighth with a runner on first and a 2-0 count on the batter, but he promptly shut down the Thundering Herd offense. After Tuesday’s win, the Hokies headed west to face East Tennessee State on Wednesday. The Buccaneers came into the game with a record of 23-8, but Virginia Tech won a hard-fought game, 4-2. Carson Taylor’s RBI triple broke the tie in the seventh, and Zach Brzykcy closed it out in the ninth for his third save of the season. It was the Hokies’ third consecutive win, and they’ll be on a high note heading into the critical weekend series against Duke. First pitch on Friday is scheduled for 6 p.m. and it can be seen on ACC Network Extra. TSL reports on a lot of different sports these days, can you include the sport in the headline or teaser please? Any update on the Softball team and their big series with JMU recently? Screen shot of standings missing from the article.